The poor distribution of meteorological stations results in a limited understanding of the precipitation pattern in the Tianshan Mountains. 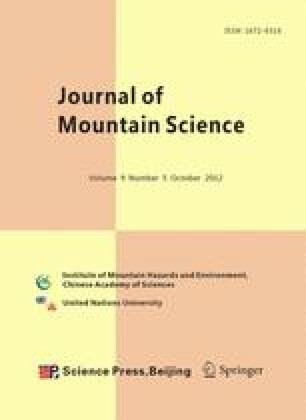 The spatial patterns of precipitation over the mid Tianshan Mountains were characterized based on the TRMM 3B43 monthly precipitation data. By comparing satellite estimates with observed data, it shows that TRMM 3B43 data underestimate the precipitation in mountain region. Regression models were developed to improve the TRMM 3B43 data, using geographic location and topographic variables extracted from DEM using GIS technology. The explained variance in observed precipitation was improved from 64% (from TRMM 3B43 products alone) to over 82% and the bias reduced by over 30% when location and topographic variables were added. We recalculated all the TRMM 3B43 monthly precipitation grids for the period 1998 to 2009 using the best regression models, and then studied the variation patterns of precipitation over the mid Tianshan Mountains. The results are well explained by a general understanding of the patterns of precipitation and orographic effects. This indicated that the Tianshan Mountains strongly influences the amount and distribution of precipitation in the region. This is highlighted by the confinement of the precipitation maxima to the windward (northern slope). And complex vertical changes in the provenance and distribution of precipitation, like that a negative increasing rate of precipitation in the vertical direction exists in the north but does not in south. The results have also revealed large gradients and different patterns in seasonal precipitation that are not simply related to elevation, the distribution of precipitation may also be affected by other seasonal factors such as the sources of moist air, wind direction and temperature.